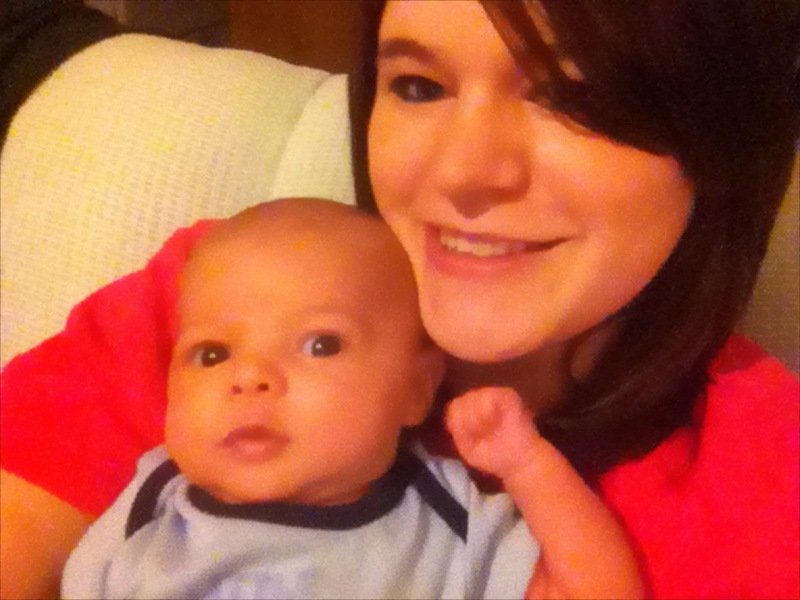 Ashtyn Scott is 20 years old, has a 13-month-old son and is married to his father. She is the admin of one of the most liked Facebook pages for Teen Moms, Teen Mommies :]. Her favorite color is pink, she loves to be with her son and enjoys cooking! What did you think about Teen Moms before you became one and why? Before I became a teen mother I always figured it could never happen to me! But it did. I think some teen parents don't take care of their children as they should, but a lot of my friends are teen moms and they're some amazing mothers. Were you using birth control while you were sexually active? I was on the birth control pill when I got pregnant and while being sexually active. My breasts hurt really bad, so I told my boyfriend (husband now) that he needed to get a test. I took the first test at Wal-Mart while I was at work, and then took 5 more when I got home. All were positive. When you found out what were you first emotions and who were the first people you told? I started crying when I found out and just worried what my parents would say. I worried if I'd be a good mom or not, I never ever considered any alternative other than keeping my child. When people-in general- learned about your pregnancy how did that change your relationship with them. How did it make you feel? A lot of people were shocked to know I was pregnant. My mother was really shocked but supportive; my mother in law was also supportive. I kind of fell apart from my friends, but it doesn’t bother me like it used to. I found out I was pregnant when I was 2 weeks along. I gained 31 pounds the whole pregnancy and gave birth on my due date, which was also my husband and my two year anniversary via c-section. That' too cute! Briefly describe what life was like right after the birth of your child. After my son was born life was very hard. He was a great baby but it's hard to adjust to no sleep and to learn to think of another little person before you. Were you able to finish school? Are you currently furthering your education? I was finished with high school when I became pregnant. I am currently in college hoping to get into nursing school this Fall. I hope to become a Registered Nurse in a few years. What do you feel is the common misconception about teen moms? I think a lot of people think being a teen mom is a bad thing, that all depends on how you perceive yourself being a teen mother. I think I'm a great mom. It's not easy having a child at a young age, but it is what you make it. You are a part of a Facebook page that has over 1,000 likes for Teen Moms how did you become a part of it? I liked the page Teen Mommies :] after I became a teen mother. They were in need of an admin, I thought it would be fun and they gave me the job! I have been an admin for a little over a year. Life now, is still tough. I got married to my son’s father in August 2011 and now I work hard at being a stay at home mother and full time college student. It's very hard but very rewarding being able to watch my son grow and learn. What do you feel is needed to reduce the number of Teenage pregnancies? I think teens need to be more aware at how easy it is to become pregnant. Don't think that you won't get pregnant, I thought that and it happened to me! What do you feel Teen Moms need the most of to make a healthy future for them and their children? Teen moms need support. That's the main reason I'm doing so well. My mom watches my son while I'm in school and my husband helps me around the house when he isn't working or in school himself. He was 21 when I got pregnant at 18 with Braden. He is older, but we still struggle some. Without the support from our family and friends, we wouldn't be able to have and accomplish all that we have!